Builder Fernando Nelson's Richmond District work. Fernando Nelson was the pioneer residential builder in the Richmond District whose quality construction set a standard of excellence and affordability that drew hundreds of families out beyond the cemeteries to make their homes in this emerging neighborhood in the early 20th century. Because of his influence in those early years of development, he should be recognized as the Father of the Richmond District. By the time Nelson came to the Richmond District, he was a respected contractor who had built a number of quality homes in Noe Valley, upper Castro, and Duboce Park.1 The first parcels of land that drew his interest out to the "wilderness" north of Golden Gate Park had been the site of the old Bay District Race Track that had served as Camp Merritt, a staging area for troops awaiting deployment to the Philippines during the Spanish-American War in 1898. The advantage of the property was that it was graded, near public transportation, and had just had water and sewer lines completed when he bought it in 1902. In the area of First to Third Avenues, A to C Streets,2 Nelson would acquire two full blocks and two half blocks for development. There was a simple formula to how Nelson worked. 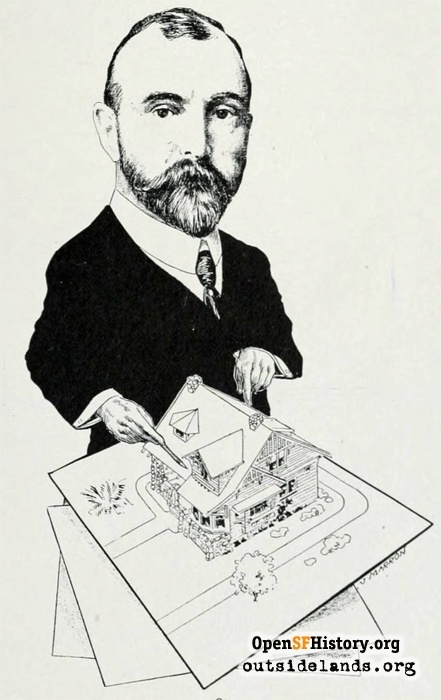 He didn't build a tract of land as a modern subdivision speculator would today---building mostly identical floor plans, advertising and hoping for sales. Nelson's methods were more personalized. He built to the customer's specifications and budget. He only started a project when he had a commitment from the client. If a person wanted to buy just a lot in his blocks so another contractor could build their home, Nelson had no hesitation in selling it. He also generally left corner lots vacant to be sold at a higher price for apartment buildings or commercial space. Nelson's specialty was homes and flats, not apartment houses and stores. He had worked with his brother-in-law as a partner from 1889 to 1891, building flats in the Haight-Ashbury, and understood the design features needed to stack units.3 He even built his early homes with plumbing in the rear of the structure, so that the single-family house could easily be converted to flats. The properties at 676 and 680-2nd Avenue are perfect examples of the convertibility of a Nelson home. Both were built as homes, but as the building permit for #676 said in 1914, "home originally designed to be turned into flats. One story added to kitchen with porch and outside stairs." This allowed for the addition of a story in the rear for an upstairs kitchen, with a partition alongside the interior stairway to the top floor. The property at 680-2nd Avenue has come full circle, since it was built as a home, converted to flats, and restored to a home again. Nelson generally offered two floor plans, which he carried in his pocket on an index card. On one side of the card was plan A, and on the back was plan B, but in striving to meet customers' needs, he could make additional variations to these plans upon request.4 The exterior elevation details usually came from a planing mill's pattern book or from Victorian embellishments Nelson designed and bought in bulk. One signature detail, consisting of redwood pieces jig-sawed into circles and attached in a row above the front entry, became known as "donuts" and can be used to identify some Nelson homes in the Eureka Valley or inner-Richmond neighborhoods. Nelson became the consummate developer by acquiring the property, designing the building, and even financing the sale, but he always had an eye to customer satisfaction. In one of his rare ads, in the San Francisco Call, Fernando Nelson nicely summed up his operational credo. The ad read "I will aid you in selecting and perfecting the design, plan all the details, work out all your own personal wishes, gratifying every fancy, and build your home for a small down payment and balance the same as rent. "5 Nelson also carried the mortgage on the property in his early years of operation, even making personal calls to collect cash payments every month. Nelson found little need to advertise, letting his craftsmanship, business style, and auto exploits do it for him. He could always be counted on to drive his automobile in all the Richmond District parades. Nelson developed a method of operation in Eureka Valley that he replicated in the Richmond and in all subsequent projects. He would move into the neighborhood, build a fine home to live in, and conduct business from there, with his shops and lumber storage on adjoining lots. For the first projects in the Richmond, he built his home at 684-2nd Avenue, with a shop adjoining the back of the property facing C Street. By 1909, he had built a fine corner home for his newlywed eldest son William at 694-2nd Avenue, while he lived two lots away with his wife and three younger sons and daughter. By 1909, Fernando Nelson was a wealthy man and a pillar of the community. He was an officer in the Richmond Improvement Club and president of the Richmond Masonic Temple. The Richmond Banner, in its neighborhood booster issue of August 27, 1909, took a few liberties in praising Nelson. They claimed "Mr. Nelson has erected upon an average at least one house in the district for every working day in the week for the past six years, and it is agreed that if all of the homes erected by him were placed side by side that the total aggregate would reach nearly eight miles. "10 Although his home volume was greatly exaggerated, still Fernando Nelson was being respected as a leading citizen in the neighborhood, who had done more than any other single individual to effect the phenomenal growth of the district at that time. Buoyed by his new wealth and position, Nelson-the-carpenter/builder would make a dramatic change by moving to the wealthiest enclave in the neighborhood. In 1909, he bought a double lot in Presidio Terrace and had the leading architectural firm of MacDonald and Applegarth design a mansion later described as "an Elizabethan cottage on a mammoth scale. "11 Nelson & Sons would build their first home designed by professional architects, and it would influence their work from then on. 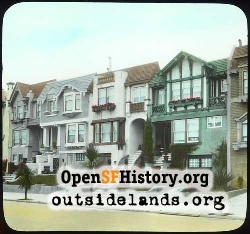 While building #30 Presidio Terrace in May 1910, Nelson bought the entire block and a half that had been the Chutes amusement park, stretching from the east side of 10th Avenue and the block across the street between Cabrillo and Fulton streets, 10th and 11th Avenues.12 At the northeast corner of 10th and Fulton he would build a half-timbered home with heavily textured stucco, leaded casement windows, and a rolled roof resembling a Cornish thatched cottage that was closely modeled after his home in Presidio Terrace. 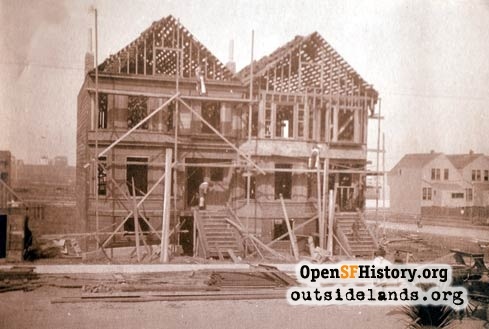 Instead of Fernando moving from Presidio Terrace, William and his family moved in and managed the business, with its lumber storage and carpenter shop alongside and behind the home, facing Fulton Street. The last Victorian-style buildings Nelson had used since the 1890s were built on these blocks in 1911, and his last few flats were constructed there as well. These blocks were also the start of his transition to the then-popular Mission and Mediterranean styles, with greater emphasis on elegant homes. The next eldest son, 21-year-old Frank Fernando, had joined the firm, bringing the asset of having taken correspondence courses in drafting and architectural design, which he would get to apply in all future buildings. Fulton Street offered an opportunity to experiment with building on larger lots, so the Nelson office-home on the corner of 10th Avenue and four homes in the next 3400 block were designed for larger lots. The 700 block of 10th Avenue shows the clearest example of the transition of styles, where wood and shingles give way to stucco, projected brackets, and curving roof lines. 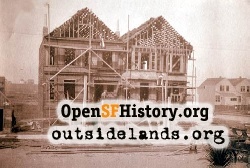 In February 1911, while work was moving rapidly on the Chutes property, Fernando Nelson bought a new parcel west of Park Presidio Boulevard, between Geary and Clement.13 For $90,000, Nelson secured the half-block on the east side of 16th Avenue, the full block in between, and the west side of 17th Avenue at roughly $1,000 per lot. He would have to do the grading and pay for sewer and street work himself, but the frontage on both Geary and Clement streets could be sold for commercial lots, and he would build homes in between. When the project was ready for building near the end of 1912, son Frank occupied the first home at 315-16th Avenue, and the Nelson project management style continued. From that location, the Nelson brothers oversaw two smaller projects in the west side of the 200 block of 15th Avenue and a half block north of California Street between 15th and 16th Avenues. These homes would be the last projects in the Richmond District for the Nelson family. By 1914, they had their eyes on two new parcels in the Sunset District. Both properties required far more sand moving and grading than any project in the Richmond. 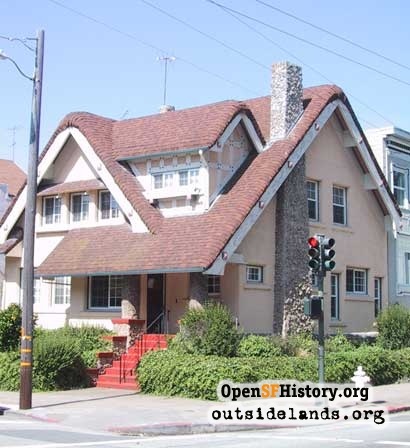 The first project they called Parkwood Heights stretched up from Carl Street to Parnassus Avenue, between Arguello Street and Hillway Avenue.14 William again moved in 1915 to a corner home at #1 Hillway to supervise the building of forty homes on a very steep block. Frank remained at 16th Avenue to complete the Richmond District buildings, but moved to Lincoln Way in 1916. Fernando too would leave the Richmond in 1916, selling #30 Presidio Terrace and building a home at 28th and Lincoln Way to supervise the construction of a new development called Parkway Terrace. On the opposite end of that block of Lincoln Way, on the corner at 29th Avenue, the Nelsons built a home for Frank and his family, with the construction yards on the lots in between. Parkway Terrace would provide a greater opportunity for the Nelson family to get away from the restriction of 25-foot-wide lots and build detached homes on wider lots. The plan had been to build six blocks of the Parkway Terrace development, but a new opportunity surfaced that year and they stopped the project at three blocks and sold the rest to finance their purchase of West Portal Park. For thirteen years, Fernando Nelson and his family were involved in building the new Richmond District. He and his sons built sensible homes with character and stability. Some of those homes have succumbed to the bulldozer to allow for building more units on the lots, or have been enlarged by remodeling, sometimes to the extent that today there is no clue to the building's original appearance. But in most cases, the Nelson details have been preserved and cherished to provide a charming texture to the neighborhood. The father of the Richmond District built well and has left us a legacy of buildings of character well worth preserving. 1. The Nelson buildings in these areas are documented in Victoria's Legacy by Judith Lynch Waldhorn and Sally B. Woodbridge, 1978. 2. 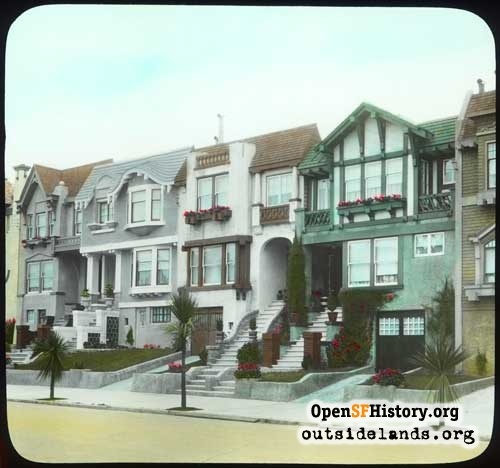 Before being changed on December 27, 1909, the east-west streets south of Point Lobos Avenue (now Geary) were only letter designations, not Anza, Balboa, and Cabrillo. 3. Fernando Nelson and William Hamerton's work can be seen on the SW corner of Masonic & Waller and west on that block. 4. Personal details about Fernando Nelson's working style came from an interview of his son, George, conducted in 1974 by Judith Lynch Waldhorn and Gary Kray. Draft notes are found in the San Francisco Public Library History Center in the F. Nelson file. 5. The San Francisco Call, March 12, 1910. 6. San Francisco Chronicle, December 16, 1906. 7. San Francisco Chronicle, April 30, 1908. 8. The Richmond Banner, November 30, 1906. 9. The Richmond Banner, December 4, 1908. The west side of the 500 block of 8th Avenue shows the most change from when it was built because this block's zoning allowed multiple-unit buildings. Nelson built sixteen homes and two flats on this block. Only twelve of his homes remain today. 10. The Richmond Banner, August 27, 1909. If you calculate six years at 250 working days a year, Nelson would have had to build 1500 homes, or since most of Nelson's buildings in the Richmond were on 25-foot frontages, he would have had to have constructed 1370 homes by this time. The reality is that by 1909, Nelson had constructed 246 buildings in the Richmond District. Even counting flats as two homes, it would only mean 322 units in the neighborhood, nowhere near either figure. 11. Patrick McGrew, The Historic Houses of Presidio Terrace and The People Who Built Them, 1995. 12. The Richmond Banner, May 27, 1910. 13. San Francisco Chronicle, February 10, 1911. 14. Parkwood Heights is the only project done by Fernando Nelson & Sons that has completely disappeared. The homes were torn down to build a multi-level parking structure for UCSF Medical Center. Page launched 21 October 2007.